← Are Markets Concerned About a Potential Trade War? U.S. indexes higher amid choppy trading. Tariff plans still causing anxiety, but partially offset by potential for North Korean denuclearization discussion. S&P 500 Index +0.3%, Nasdaq +0.6%, Dow flat, Russell 2000 +1.0%. Materials (+1.1%), consumer discretionary (+0.7%) led sector performances, though steelmakers a relative laggard. Utilities (-1.4%) largely underperformed; healthcare (-0.1%) the only other decliner. Positive breadth on NYSE (2.3:1); trading volume below average (~83% of 30-day avg.). Treasuries yields held firm; 10-yr. note yield flat at 2.88%. Commodities: WTI crude oil slightly retraced previous gains (-0.2% to $62.47/bbl. ); COMEX gold +1.2% to $1335/oz. ; industrial metals continued broad decline; U.S. dollar weaker vs. most major crosses. Economic data: Core capital goods shipments (gross domestic product [GDP] component) revised lower from initial figures, domestic factory orders disappointed (-1.4% vs. -1.3% month over month). Canadian Purchasing Managers’ Index soundly topped expectations (58.4 vs. 51.3). U.S. equities opened lower following Cohn departure. Investor concerns revolving around trade policy, potentially less market-friendly administration (details below). European stocks holding up better. STOXX Europe 600 -0.2%, DAX unchanged, FTSE 100 +0.1%. Italian bond yield premium relative to Germany back down to pre-election levels. Asian markets broadly lower. Risk-off tone is global, with Nikkei -0.8%, yen higher; Shanghai Composite -0.5%, Hang Seng -1%. Chinese banks up after bank reserve requirements eased. Treasury yields lower; 10-yr. yield -0.03% to 2.86%. Federal Reserve (Fed) Governor Brainard, considered dovish, made some hawkish comments. Commodities: Oil -1% to ~$62/bbl. amid risk-off tone, bearish inventory data; weather in the Northeast boosting natural gas; gold marginally lower at ~$1333/oz. with the U.S. dollar little changed overall; copper -1%. Economic releases: Euro area GDP expanded 0.6% in Q4 (not annualized), matching estimates. Strong ADP jobs report (+235k vs. +200K consensus). U.S. trade deficit widened to $56.6 billion in January ($55.0b expected). Fed Beige Book due out later today. Gary Cohn departure rattles markets. The departure of President Trump’s top economic advisor, though previously rumored, drove stocks about 1% lower overnight. Credited with shepherding the tax law through to passage and having a pro free trade stance, the Goldman alum was considered market friendly. His departure, apparently due at least in part to his losing battle on the recently announced tariffs on imported steel and aluminum, has sparked fears of an escalating trade conflict as the influence of the trade hawks in the White House potentially grows. 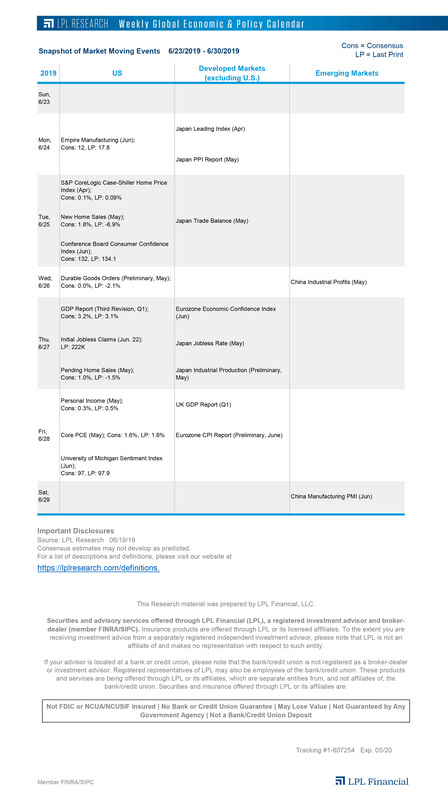 As we discussed in our latest Weekly Market Commentary, trade will likely continue to be a source of increased market volatility as tariff details emerge, NAFTA talks progress, and markets assess the much larger Chinese intellectual property abuse issue. However, we do not expect these trade risks to derail the bull market, and economic fundamentals remain sound overall. Another look at the bull market. As we noted in our latest Weekly Market Commentary, the bull market is set to turn nine years old on Friday. This is now the second longest and second largest bull market since World War II (WWII), and today on the LPL Research blog we will take a look at all of the bull markets since WWII and show exactly how this current bull market stacks up. Strong jobs number. The ADP Employment report came in this morning with companies adding 235,000 jobs in February. This was well above expectations of 200,000 but below the 244,000 growth seen in January. Still, this is another positive sign for the overall employment backdrop. The next big piece of employment data is the Nonfarm Payrolls report on Friday, with economists expecting that 200,000 jobs were added in February.